Is fear and apprehension preventing you from becoming the success you always dreamed of becoming? Lets understand where your anxiety is coming from – and find out how you can overcome it. What’s holding you back from achieving success? Is it a lack of talent/skill to do something worthwhile? Chances are you’ve got a compelling passion for a particular type of skill, whether it’s assisting others, developing a product, or supplying a service. As a counselor, I’ve found that the number one reason most people never take the plunge and start working on their passion is anxiety. Where oh where does the Fear come from? I completely understand apprehension because I’ve experienced it myself. Many times in the very far past while was helping others to defeat personal struggles … I found that instead of feeling a sense of achievement, I was drained. I was seeing people go on to better futures and more fulfilling lives through finding their true sense of Self – yet here I was grounded, and almost resentful, after my work was done. Instead of anticipating the next successful patient, I almost shunned taking many on. I was in a dilemma and I did NOT like it one bit! When I started feeling this way a few years back, I knew there had to be a change – in my life, in the way I thought and in the way I approached my work. But at the same time, I was fearful that if I changed, the whole thing would go south and I would fail miserably. With lots of introspection I realized that the reason for this negative thought process was this: that instead of really hearing my Self, I was listening to everyone else. I intrinsically knew what would make me feel content. I’d done all the exercises I recommend to my own patients and asked myself all those magical questions to find out who I really am – but I’d repressed the power they held over my own life. I was making decisions based not on my own core values, but on what was critical to others, and apprehensive about what would happen if I didn’t heed them. I feared being a “loser” because it would affect my family, my friends, my co-workers and my own self esteem. I should have been more afraid of going against my own wants, needs, and core values! 1) Your Life is Your Own: You must realize that your life is your own. You will never achieve an overwhelming sense of personal fulfillment until you recognize your core values and stay true to them – regardless of what someone else has to say about it. Your excitement is fueled by a career that focuses on the key values most important to your sense of Self. And that passion is what fuels your vision; your inspiration to get up each morning and face the day with a sense of enthusiasm. 2) Believe in Yourself: You must have belief in yourself. Even if other people around you are skeptical, you can’t let that deter you from your goals. Only you can create the “big picture” of what your dreams will look like when everything is in sync with your values, and it will never be the same as someone else’s creation. Complete faith in your Self is what will keep you going, facing obstacles and defeating them, doing the things that will move you ever closer to the big picture goal. It’s not easy to stay true to your Self when so many others are imploring you to give up on your dreams and passions. And it’s certainly no less challenging to keep moving forward when you have an aversion to change. 1. What are the tasks I am dreading? How can I get them over with and get on with what I love? 2. Who am I assisting by staying true to the Big Picture? 3. What am I doing that someone else couldn’t do as well? 4. What is the worst thing that could happen right now? Is it really all that distressing? When I sat down and honestly answered these questions, I found a renewed sense of purpose in my life’s work. The passion was back – and I was more successful than ever helping others heal positively to achieve their goals. Becoming a successful person takes energy(you need to DO the work), a clear vision(you need to focus on the BIG Picture), and most of all, the ability to defeat(kick those negative thoughts) your fears and anxieties. Lets STOP listening to other people and stay in harmony with what your Self is saying. You can take your dream and turn it into something really awesome! You just need to have complete and utter faith in your SELF. You are special and there is NO ONE else like you in this Whole Universe. Believe it cause its true! My question to you: Have you ever found yourself going through anxiety over your goals and dreams? How did you overcome your fears? Lets share and learn from each other. Share your thoughts in the comments below. p.s. Since this month’s theme is “Success”, stay tuned for more articles on the subject. 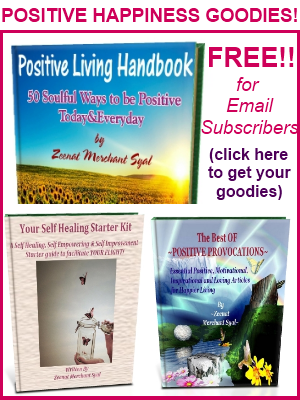 Get the latest articles(FREE) as soon as they are published, by Email OR RSS.PLUS if you are an Email Subscriber, You get the Positive Living Handbook(new 2012 release! )+My Ebook “The Best of Positive Provocations”+ “Your Self Healing Starter Kit”+a free Positive Newsletter every month with the months highlights+Positive Living Affirmations +New Tips and articles which are Exclusively for Email Subscribers and not published anywhere else. Come Join the facebook community & follow me on Twitter and Google+ for Positive Provocations Everyday! Positive Control – What CAN you really control? Your self sabotaging behavior stems from lack of self confidence in your own abilities. Start by first ‘believing in yourself’. If you type “passion” in the search bar on the top right corner of this website, you will find a list of articles that can guide you to start beiliving in yourself. You can email me too if you need help and guidance in specific areas of your life. I would love to help you. Your dreams need you to believe in them first. I just know you can do it! Try it and if you get stuck anywhere…just message me 🙂 I;m always here. Came here through the fb link you posted and glad I did. So wonderfully written and I can identify with almost everything you wrote. I dialogue with oneself, an ‘inward gaze’ helps a lot. Great post. I’ve struggled with anxiety a lot in my life. I’ve been afraid of everything and everyone, which made life hardly enjoyable. I’ve overcome my fears by taking action. It’s hard to do the first step, but once you do, your life will be so much better. Follow & Connect With 50,000+ Monthly Readers! Enter your Awesome EMAIL & RECEIVE: My Ebook "THE BEST OF POSITIVE PROVOCATIONS"+"SELF HEALING STARTER KIT"+POSITIVE LIVING HANDBOOK+BLOG UPDATES Free Straight IN your INBOX! “My sessions with Zeenat are the highlight of my week! I look forward to talking with her. She makes it so easy to open up to even the most hardest and painful memories that I need to deal with. 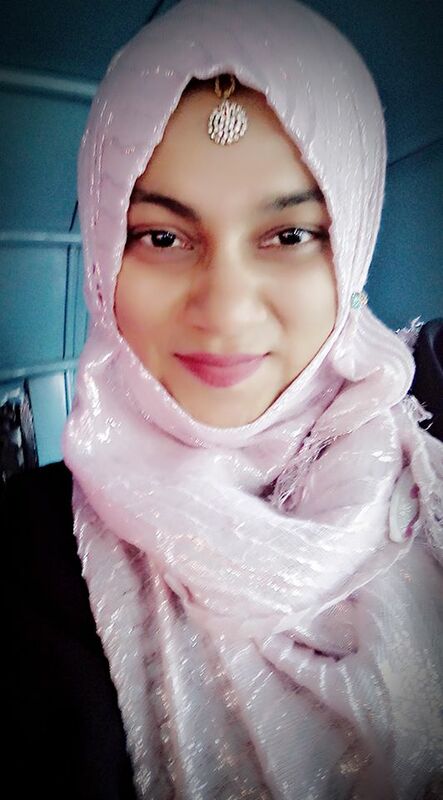 She makes me feel that healing is easy and I’m so happy I have started my journey of healing with Zeenat.” ~ Alyssa. M, U.S.A.
For Online Counseling with Zeenat CLICK HERE! Follow Zeenat's Positivity on Instagram! © 2009-2018 Positive Provocations – All rights reserved. No content on this site may be used in any fashion without written consent from Positive Provocations.